Thursday April 27th 1893 It was a little more pleasant. I did a little work in the yard. Will got more coal in the cellar and then went over to Woolfs for potatoes. I worked in the yard most of the afternoon. Fanny started home in the forenoon. Friday April 28th 1893 It rained again this forenoon as hard as it could pour down. I did a lot of baking and a little sewing before noon. As soon as I had my dinner I went over to help sew carpet but found they had it all done. I stayed and help put the little chickens out and when I came home Edith and Hattie came too. Will and I went to the theater in the evening the play was "The Fast Mail." 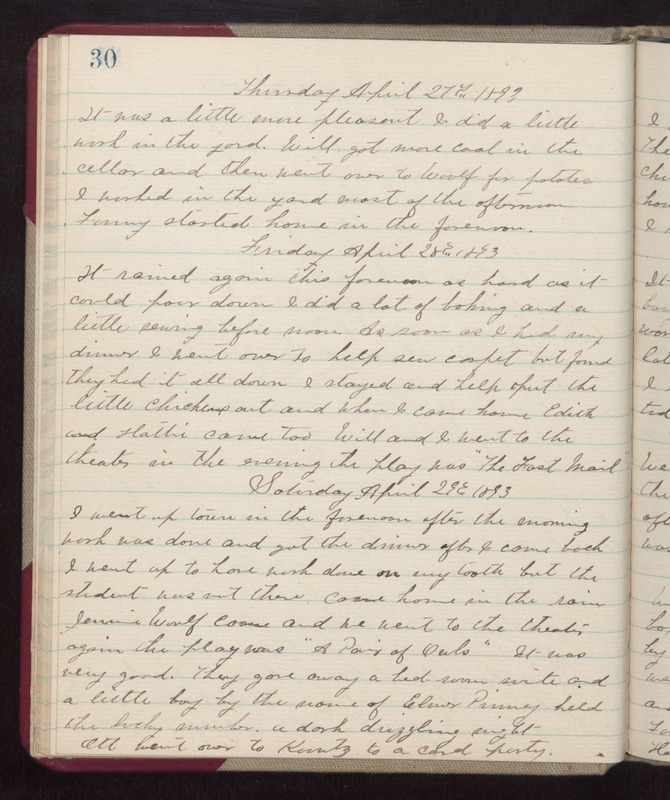 Saturday April 29th 1893 I went up town in the forenoon after the morning work was done and got the dinner after I came back. I went up to have work done on my tooth but the student was not there. Came home in the rain. Jennie Woolf came and we went to the theater again, the play was "A Pair of Owls." It was very good. They gave away a bed-room suite and a little boy by the name of Elmer Pinney held the lucky number. a dark drizzling night. Ott went over to Kuntz to a card party.